The special weaving design guarantees a high pressure performance. Superior adhesion level and flow performance compared to an all polyester weave. 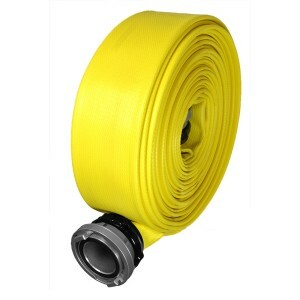 Hose shall be made from 100 percent high tenacity synthetic yarn circularly woven and completely protected and lockedin by tough highly resistant synthetic nitrile rubber, forming a single homogeneous construction without the use of glues or adhesives of any type. Meeting all requirements of NFPA 1961.